Neat FogBugz In Depth Movie. Here’s a quick link to the “FogBugz In Depth Movie“, which is an entertaining run through of the new stuff in FogBugz 6.0, and re-enforces some of the reasons FogBugz works the way it does. Well worth a look if you’re thinking about trying FogBugz, or even if you’re an existing user. Posted by ianmjones at 3:51 pm on September 18th, 2007. Will the iPhone be on Vodaphone in the UK? I just called Vodaphone to check up on something on my latest bill only to be told that they couldn’t get any info on my account as their systems were being upgraded. The rep said someone would call me back when their systems were available, it would be about an hour and a half. That was just before 9am. There’s a London Apple event happening at 10am. This might be a complete red herring, a total coincidence, but could all the rumours about O2 getting the iPhone be wrong? Could it be Vodaphone? Update: Oh crap, it’s O2, the one carrier I vowed never to use again after some seriously bad experiences with their customer reps! Posted by ianmjones at 8:16 am on September 18th, 2007. 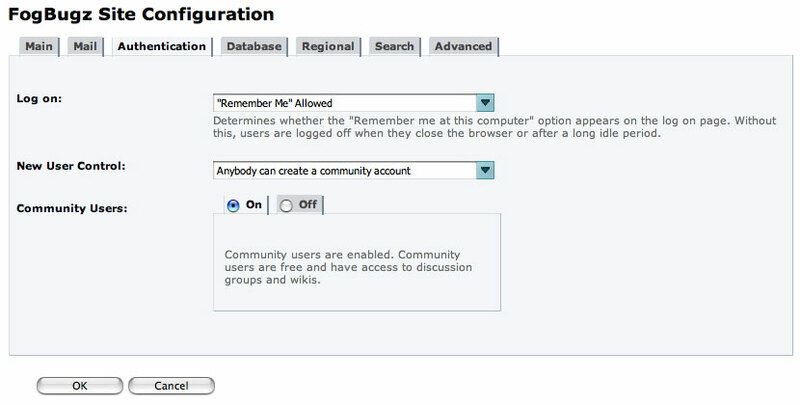 If you decide to activate the community users functionality in FogBugz 6.0 so that people can create an account that keeps proper track of your discussion groups, don’t forget to actually allow registration! To make sure community user accounts can be registered, go to Settings > Site from the top right menu, and then select the Authentication tab. 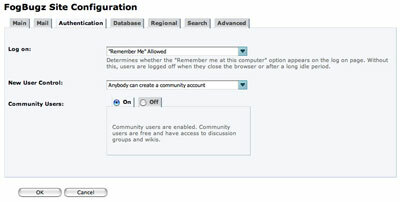 Make sure the New User Control drop down is set to “Anybody can create a community account”, and the Community Users feature is on. Once you click the OK button you’ll have a little “Register” link in the top right of your FogBugz page when it’s visited by someone who’s not logged on. I missed that “Anybody can create a community account” step first time round, so thought I’d share it. Posted by ianmjones at 9:46 pm on September 4th, 2007. FogBugz 6.0 for Windows released. Excellent news, FogBugz 6.0 for Windows has been released. It’s no secret that I and many others have been using the betas for some months now, and boy am I happy with this release! There’s a tonne of cool new shiny things to play with in this new release, you should definitely check out the What’s New page. My favourite new features and improvements? It may be the penultimate item in the list of new features on Fog Creek’s list, but it’s number one on mine! I don’t have to duplicate all the search/filter functionality of FogBugz in CaseDetective any more. Woohoo! The search and filter mechanism has been totally overhauled, you can now search by many different axis, in any combination, and then search within the results of a filter. This feature is going to make a lot of existing FogBugz users incredibly happy. It may not sound like much, but being able to resolve and close a case I opened with the press one button is going to save me countless hours. There are so many other great features introduced and improved in FogBugz 6.0, such as the Wiki functionality, Evidence-Based Scheduling, automated timesheets, community users and many more. It really is a stonkingly good release, my hat goes off to Fog Creek for delivering such a great product in FogBugz 6.0. So, now I have to work like crazy to get CaseDetective 2.0 out the door. Thanks a bunch Fog Creek! Posted by ianmjones at 8:53 pm on September 4th, 2007.